Geography Notebooks / Quaderni di Geografia / Cahiers de Géographie / Cuadernos de Geografía is a scientific journal of human geography published in four languages (Italian, English, French, Spanish). This journal purports to be a forum for debate devoted to the promotion of the theoretical, methodological and thematic investigation in all the fields of geographical research. 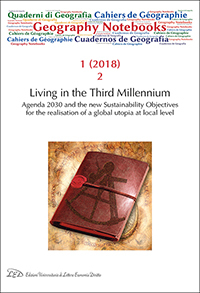 For this reason the journal aims to investigate the complex regional diversity of the planet, which is due to a combination of natural and anthropic elements, also through the analysis of the representations of specific places and narratives produced by the territorial action of human groups. Geography Notebooks / Quaderni di Geografia / Cahiers de Géographie / Cuadernos de Geografía has therefore the ambition to present the variety of human geography, in its descriptive, rationalist, structuralist, functionalist, quantitative, regional aspects. At the same time, it aims to give space to humanistic, immaterial, symbolic and communicative dimensions, which bear values, aspirations, ambitions, spirituality, deriving from historical, cultural, identity and gender differences. In this perspective, the journal is necessarily inter- and multi- disciplinary also to be coherent with a strong tendency in contemporary human geography that conceives the interrelation with other disciplines as the prerequisite for the study of the complexity of the "world system". For these reasons this international journal welcomes not only articles of geographers but also works that fall into various disciplines in social sciences, humanities and earth system sciences. The journal is so open to all the researchers whose contribution can enhance the plurality of points of view about the relations between humans and the Earth. The diversity of geographies manifests itself in a plurality of approaches and research themes grounded in rationalistic and humanistic theoretical frameworks further supported and enhanced by a variety of human, social, natural, territorial, economic and political sciences. As the journal enters its second year, the editorial board of Geography Notebooks invites researchers working on topics variously connected to the approaches and themes of geography to submit research papers. Submissions are welcome from all kinds of research perspectives, with a view to stimulating debate within the journal and laying the foundations for future thematic issues. This Call for Paper is open to comprehensive research papers involving specific case studies and grounded in any of the multifarious theoretical and methodological approaches of contemporary geography.